The most anticipated feature of the Tesla Model 3 is its starting price: $35,000. It’s expected to make the sedan the first relatively affordable mass-produced long-range all-electric vehicle widely available. GM’s Chevy Bolt EV might come to mind, but its low production and narrow availability disqualify it for that long title. But $35,000 is for people willing to get a bare Model 3 without any option. The actual average sale price after options is expected to be much higher. Tesla CEO Elon Musk said last year that he expects it to be close to $42,000, but new data suggest that reservation holders are preparing their budgets for a significantly higher price. 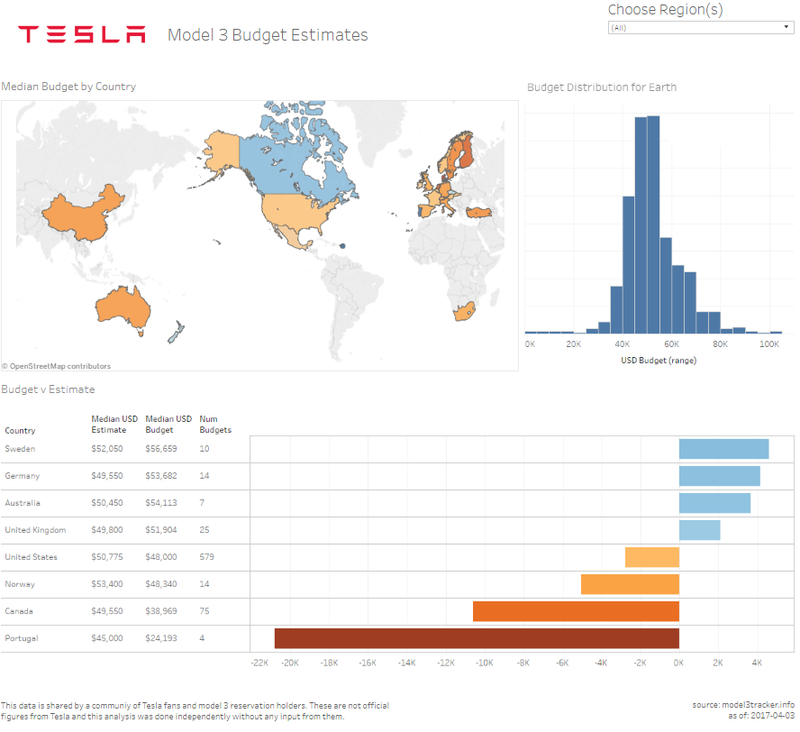 Data scientist Ben Sullins, who brought us great analyses on the most popular options for the Model 3 and a tool to visualize the cost of using the Supercharger network, is back with an analysis of the average budget that reservation holders are planning for the Model 3. The budget is actually a great metric to help determine the average sale price because while we already had a good look at what option reservations holders want, it doesn’t mean that they will be able to pay for them and since we don’t know about the price of those options, the budget becomes a better metric. Sullins again used data from almost 8,000 Model 3 reservation holders surveyed at Model3Tracker.info. The results are that most reservation holders are preparing to pay between $45,000 and $55,000, which makes sense since the bare Model 3 or nearly bare Model 3 are very rare options among the reservation holders surveyed. Most of them are looking for a battery pack upgrade from the base model, which is expected to offer 215+ miles of range, to bigger packs that could allow up to 300 miles of range. The Autopilot/Self-driving options will also significantly increase the price. A buyer choosing only one of those options could easily see the price increase to $45,000 and both options could push the price to $55,000, based on the historical cost of Tesla’s options. Then you can add aesthetic upgrades, like interior options, wheels, and paint, and the price can easily go past $60,000 for a fully-loaded Model 3. It would make sense with the base price of the Model S going over $70,000 later this month due to the discontinuation of the Model S 60. The average sale price of the Model S will therefore also go up – likely closer to $90,000. At least, it’s interesting to see that reservation holders are managing their expectations and they are prepared to pay significantly more than the base price – or even the $42,000 average price that Musk referenced. With this said, I would argue that the Model 3 reservation holders who participate in those surveys are generally more active in the Tesla community and therefore, they are often more informed about options and pricing than the average reservation holders. It’s very possible that the average goes down closer to what Musk expected once all of the 400,000+ reservation holders are involved. Though almost 8,000 reservation holders is a nice sample size.